I can’t say for certain when photo Christmas greeting cards came into vogue, but I am pretty sure my Dad was on the cutting edge in the early fifties when he began taking photos of his kids specifically to include with the family Christmas greeting. My dad had always had an interest in photography and even studied photography at a community college for a time. So it was always a major production. My mother was in charge of wardrobe and hair (not a problem for the boys, but always meant a new hairdo for my sister and me). Dad took care of the technical aspects of lighting, metering, and composition. When we were young we just sort of accepted the process as something that went along with the pre-Christmas activities like shopping and parties. 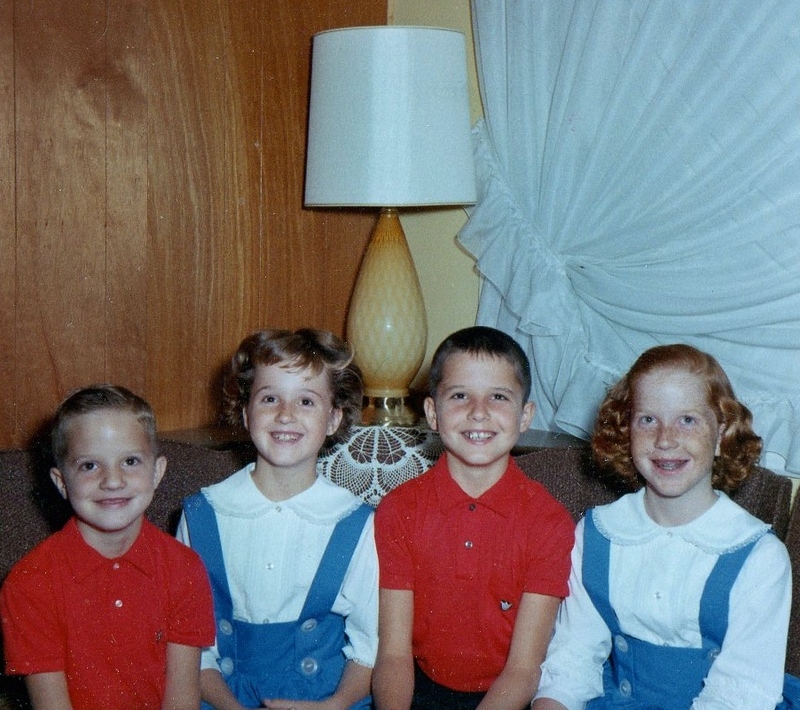 As we got older, we began to rebel a bit against the “staging” of the photos, especially the matching clothes (and for me, the unnatural hair styles). My parents acquiesced in regard to the matching clothes and my hair, but continued the tradition of producing family photos for Christmas cards pretty much until all of us kids were in college. Eventually, these photos my father took would be turned into actual photo greeting cards by companies that had originally gone into business to develop and print photographs. When all of us kids struck out on our own, my folks would occasionally send out a photo Christmas card, sometimes with just the two of them, but more often with members of their extended family. As much as we fussed as teenagers about having to “pose” for these family photos, I am grateful that my mother saved a copy of each one. These annual photo sessions help to recount the various stages of our young lives and provide a clue to the trends of the day. The backgrounds often included our house or yard. Sometimes Christmas trees or decorations would play a prominent role. Other times we would be sitting on our couch or lined up by height against a wall with knick knacks or Grandma’s oil painting in the background. You can see how we grew and changed and developed our own personalities each year. When my husband and I got married, we sent out our own photo Christmas greeting card for the first time 4 months after the wedding. The photo was of the two of us in my folks living room opening our wedding gifts after our reception in their back yard. The next year, our son was alone in the photo propped in a chair holding a soft Christmas ornament. Two years later he was joined by his sister and except for a couple of times when we had photos taken of us with the kids, it was just the two of them. When our children struck out on their own, we decided to continue the tradition by taking pictures of us and our travels to post on our Christmas greetings. This year will mark our 31st year of sending our friends and family photo Christmas cards. I hope to get a picture of the four of us while we are in the Galapagos Islands next week to go on next year’s card. Like my mother I have kept a copy of each card in a book that holds a prominent place along side the other Christmas decorations, providing a graphic reminder of the true blessings we celebrate at this time of year. This entry was tagged Blessings, Christmas, Christmas Cards, Family, Family History, Photo Christmas Cards, photography. Bookmark the permalink.